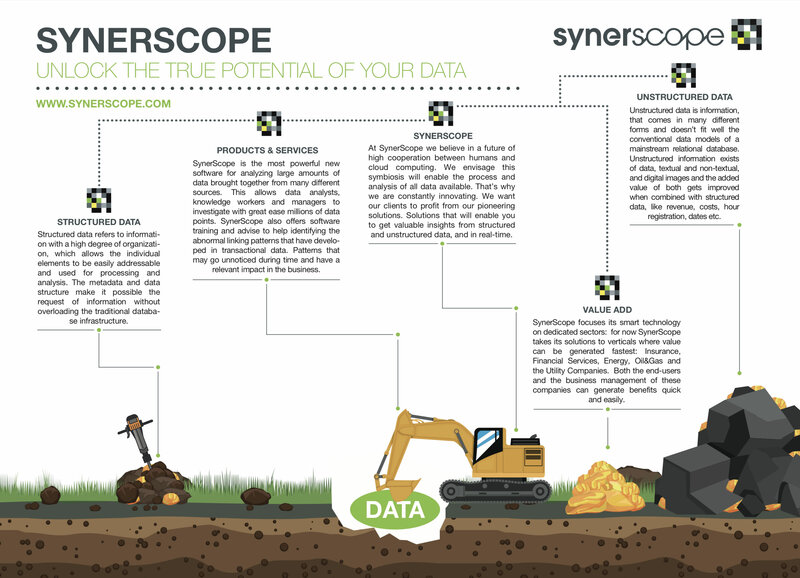 As an innovator, SynerScope permanently pushes boundaries in Big Data Technology. We create new visions and next-generation solutions by handling massive volumes of multiple types structured and unstructured data. In parallel and with the speed of light. SynerScope delivers easy to use, affordable and highly effective solutions based on the flagship products Ixiwa and Iximeer. In order to support you when you need data the most: when important strategic or daily operational decisions must be made. Or to show you at one glance promising strategic business opportunities. SynerScope was founded in 2011 as a spin-off of Eindhoven University. It is headquartered in the Netherlands with an office in Helvoirt, The Netherlands. The company employs 20 people and works with Global partners like Accenture US, KPMG, Microsoft. Leading companies such as Achmea, Exxon, Shell, Stedin, Vivat and Volksbank use SynerScope solutions for their Big Data initiatives.